Vegetarian burgers, like these beetroot and chickpea burgers, can be just as tasty as ordinary ones. 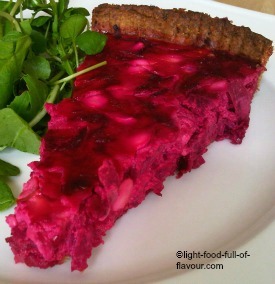 I am using grated raw beetroot (beet) in the burgers together with mashed cooked chickpeas. 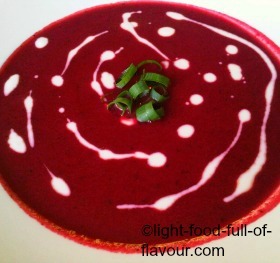 Beetroots are really nutritious. They are a rich source of antioxidants and also contain potassium, magnesium, iron, vitamins A, B6 and C and folic acid, as well as protein, carbohydrates and soluble fibre. Chickpeas also contain soluble fibre, a type of fibre which is good for regulating blood sugar and which helps you feel full. Like all pulses, chickpeas are low in fat and a rich source of protein. I cook the burgers in the oven, which is the healthiest way to cook – not to mention the least messy! By placing them on baking parchment you don’t need to use any fat either - making these beetroot and chickpea burgers really low in calories as well. I serve the burgers with caramelised red onion and peppers (bell peppers) and sweet potato wedges. While sweet potatoes are incredibly healthy and low GI food, they do contain a large amount of carbohydrates. It is a good idea to only eat a small amount of sweet potatoes if you are watching your weight or want to lose weight (see Low-GL Carbohydrates). Butternut squash and pumpkin contain fewer carbohydrates. Add some wedges of either vegetable if you wish. 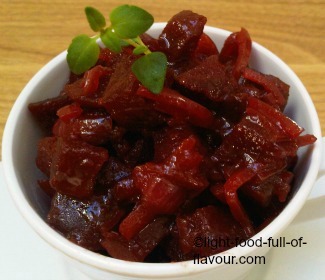 And to make this a really healthy meal, serve together with a salad containing a mix of dark green leaves. 1. Preheat the oven to 200C/Fan 180C, 400F/gas mark 6. Place the sweet potato wedges in an oven-proof dish and toss them in a little bit of olive oil. Cook in the oven for 30 minutes. 2. While sweet potatoes are cooking, cover a baking tray with baking parchment. Mash the cooked chickpeas with a potato masher or a fork and place in a bowl. 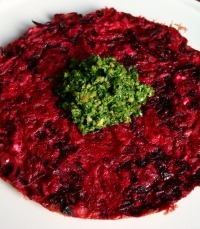 Add the grated beetroot, chopped spring onion (scallion), feta cheese, egg, salt and pepper. Mix together and form 4 burgers and place the burgers on the prepared tray. When the sweet potatoes have been in the oven for 30 minutes, place the tray with the burgers in the oven as well and cook for a further 10 minutes. 3. Place 1 tablespoon of olive oil and the sliced onion in a pot and cook gently over a low heat for about 7 minutes – stirring every now and then. Increase the heat, add the balsamic vinegar and some salt and pepper and continue to cook for another minute. Add the peppers and cook for a further minute. Remove from the heat. 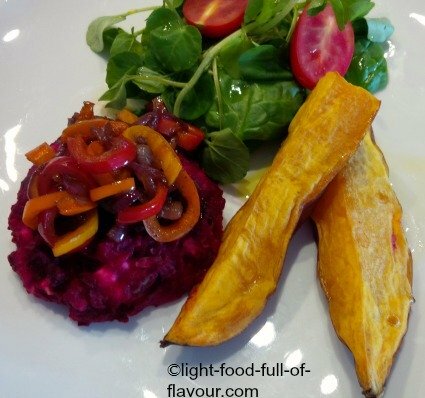 Serve the burgers with sweet potato wedges, caramelised onion and peppers and a mixed salad.